The green algae have always attracted a lot of interest because, as a group, they share a good deal in common with the higher plants in terms of ultrastructure, metabolism and photosynthetic pigments, pointing to the likelihood of a common ancestor. They possess both chlorophyll a and b and certain carotenoids, store carbohydrate in the form of starch, and generally have a rigid cell wall containing cellulose. The starch is stored in structures called pyrenoids, which are found within chloroplasts. There are two phylogenetically distinct lines of green algae, the Charophyta and the Chlorophyta; the latter are much the bigger group, but the charophytes seem to be more closely related to green plants (see Figure 9.18). Chlorophytes demonstrate a wide variety of body forms, ranging from unicellular types to colonial, filamentous, membranous and tubular forms. The vast majority of species are freshwater aquatic, but a few marine and pseudoterrestrial representatives exist. The genus usually chosen to illustrate the unicellular condition in chlorophytes is Chlamydomonas (Figure 9.5). This has a single chloroplast, similar in structure and shape to that of a higher plant, and containing a pyrenoid. Situated together at the anterior end is a pair of smooth or whiplash flagella, whose regular, ordered contractions propel it through the water. A further structural feature found in Chlamydomonas and other motile forms of green algae is the stigma or eye-spot; this is made up of granules of a carotenoid pigment and is at least partially responsible for orienting the cell with respect to light. in detail according to the species (Figure 9.5). Any one of the three variants of gamete production seen in the algae may be seen: isogamy, anisogamy and oogamy. In all cases, two haploid gametes undergo a fusion of both cytoplasm and nuclei to give a diploid zygote. The gametes may simply be unmodified haploid adult cells, or they may arise through mitotic cleavage of the adult, depending on the species. 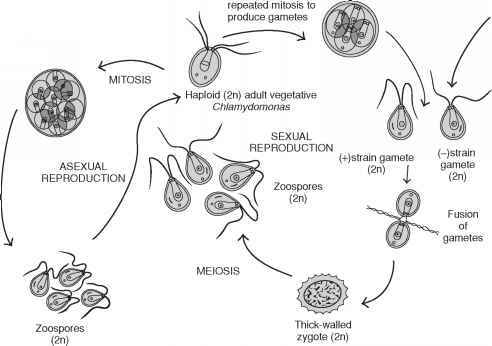 The process of isogamy, where the two gametes are morphologically alike and cannot be differentiated visually, only occurs in relatively lowly organisms such as Chlamydomonas. 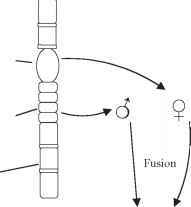 In some species we see the beginnings of sexual differentiation - there are two mating strains, designated + and —, and fusion will only take place between individuals of opposite strains. The diploid zygote, once formed, often develops into a tough-walled protective spore called a zygospore, which tides the organism over conditions of cold or drought. At an appropriate time the zygospore is stimulated to recommence the life-cycle, and meiosis occurs, to produce haploid cells, which then mature into adult individuals. In C. braunii, sexual reproduction is anisogamous; a + strain produces eight mi-crogametes and a — strain produces four macrogametes. In C. coccifera, simple oogamy occurs, in which a vegetative cell loses its flagella, rounds off and enlarges; this acts as the female gamete or ovum, and is fertilised by male gametes formed by other cells. The next level of organization in the green algae is seen in the colonial types, typified by Volvox. These, like the unicellular types, are motile by means of flagella, and exist as a number of cells embedded in a jelly-like matrix (Figure 9.6). 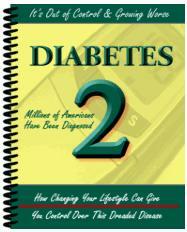 Both the number of cells and the way they are arranged is fixed and characteristic of a particular species. During growth, the number of cells does not increase. In simpler types, all cells seem to be identical but in more complex forms there are distinct anterior and posterior ends, with the stigma more prominent at the anterior, and the posterior cells becoming larger. Reproduction can occur asexually or sexually. The diversity of body forms in multicellular chlorophytes referred to earlier is matched by that of their life cycles. Two examples are described here. 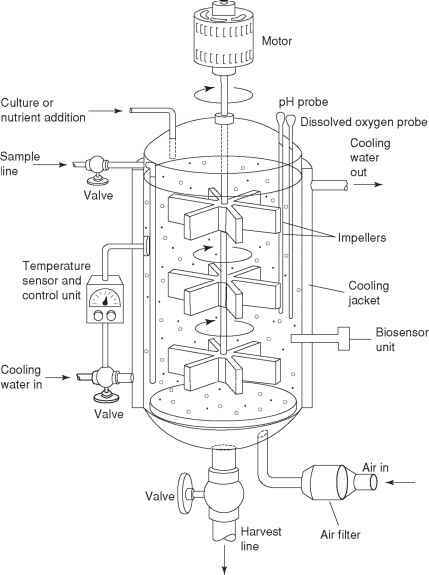 Figure 9.7 The life cycle of Oedogonium, a filamentous green alga. In the example shown, gametangia of both sexes are present on the same filament. The oospore (zygote) that results from the fusion of gametes is the only diploid part of the life cycle. Some species of Oedogonium have male and female gametangia on separate filaments distinct: anisogamy) fuse to form a resistant zygote or oospore, which, when conditions are favourable, undergoes meiosis to produce four haploid zoospores, each of which can germinate into a young haploid filament. The oospore is thus the only diploid phase in the life cycle. In Oedogonium there are species with separate male and female filaments (dioecious) as well as ones with both sexes on the same filament (monoecious). Figure 9.8 Isomorphic alternation of generations: Ulva. The life cycle of Ulva involves morphologically identical haploid and diploid plants. Fusion of gametes forms a zygote, which grows into the mature diploid plant. 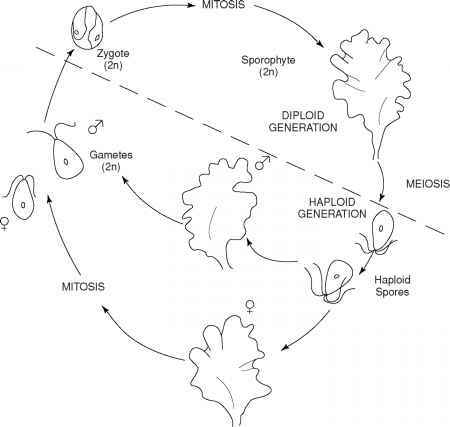 Meiosis produces haploid zoospores, which give rise to separate male and female haploid plants female gametes are morphologically identical (isogamy). The zygote germinates to form a diploid plant, indistinguishable from the plant that produced the gametes, except for its complement of chromosomes. When the diploid plant is mature, it produces haploid zoospores by meiosis, which settle on an appropriate substratum and develop into haploid Ulva plants. This form of alternation of generations is called isomorphic, because both haploid and diploid forms look alike and each assumes an equal dominance in the life cycle. It is, however, more usual for alternation of generations to be heteromorphic, with the sporophyte and the gametophyte being physically dissimilar, and with one form or other dominating. The sporophyte is the diploid, spore-forming stage in a life cycle with alternation of generations. How green algae reproduce asexually? How diploid ulva produce haploid zoospores and why?